Fresh Rose Flowers for Delivery to Philippines in all occasionsSend roses in vase flowers for delivery to Philippines from anywhere around the world. Our roses in vase are so prett that your loved ones will feel your presence when they receive the delivery of fresh rose flowers in nice classy vases you sent especially if you are far away in other parts of the globe. For Valentine's Day, red rose flowers are perfect to send! While different types and colors of rose flowers in vase gifts are available to send, aside from vase, rose flowers can also be sent as rose bouquets, roses in box or in dozens and even in baskets... you are certain to find the perfect rose vase flower to send to Philippines on the Florabella online florist web site. 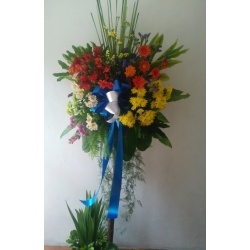 Below are a couple of Roses in Vase flower setting and arrangement you can send online for delivery to the Philippines by Florabella Internet Florist. Rose flowers in Vase also come in different colors, from Red roses, Pink roses, Yellow roses, White roses, even Blue roses. There is no doubt however that RED ROSES are the most popular for a lot to send and receive. However, that shouldn't stop you from choosing different color roses in vase for your loved one; why not surprise your mother, wife of friend with a bouquet of blue roses, a dozen white roses, yellow roses in a vase or pink roses with chocolates, balloons and teddy bears to boot! 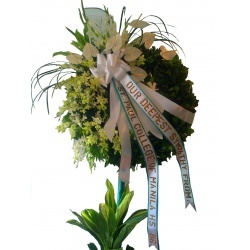 Delivery of Roses in Vase to the Philippines are handled with utmost care by by Florabella.